The software is compatible with Windows 2000, 2003, 2008, XP, Vista, or Windows 7/8/8.1/10, 2008/2012 (32-bit & 64-bit) versions. 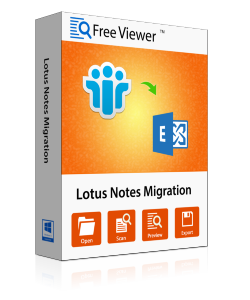 The Lotus Notes migration tool is powerful enough to perform transfer of data from Lotus Notes to Live Exchange Server accounts. Import data from Lotus Notes NSF file directly into the Live Exchange mailbox.You can map accounts between IBM Notes and Exchange for verification. Lotus Notes installation is a must to perform this conversion. Also, Live Exchange Server environment is essential for the transfer of mailbox data. Perform migration of mailbox data from Domino server to Exchange Server accounts. You can simply map the accounts between the two servers so that the data is directly saved into the mailbox folders. Running Exchange Server environment is essential to perform the migration. Similarly, Domino server environment is necessary to be running on the local machine for performing Lotus Notes to Exchange Migration. Perform batch migration of multiple mailboxes from IBM Notes to Exchange Server. Use the Tool provided by FreeViewer to make the transfer process easier. Map data between accounts of different servers. There is no data loss during the export process. Administrative credentials are not essential for mapping accounts between Lotus Notes and Microsoft Exchange. Only login information is needed for both the accounts. Option to apply Date-based filter to all mailbox data items. A specific date range can be applied to the data items like emails, calendars, to-do items, etc. This will restrict movement of mailbox data to a specific period. This will not only prevents the needless conversion of data but also saves a lot of time. Also, only selected items will import by selecting the data items & date in Lotus Notes to Exchange Migration Software. The Lotus Notes migration tool is an efficient product that allows exclusion of mailbox folders. Facility to selectively convert mailbox data from one account to another. You need to provide the name of folders separated by commas in a text box before Lotus Notes to Exchange Server conversion. Also, check a box to exclude deleted items and sent folder. Option to remove password from an encrypted mailbox using the Tool. Some emails are protected using a password. This tool removes such encryption from mailbox data and makes the export process smoother. Some emails use canonical names for an email address. Change them to a particular SMTP name or different one according to your choice. There is no data loss during transfer of mailbox data from one account to another. Data integrity and folder hierarchy is retained even after the conversion. The Lotus Notes Migration Tool allows an option between keeping email formatting and attachments. Deselecting both could save a lot of time when moving multiple mailboxes with years worth of data. 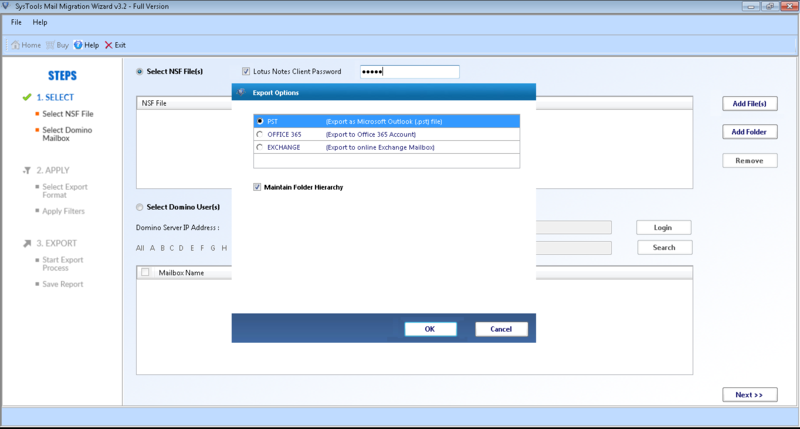 Transfer entire data from IBM Lotus Notes to Exchange Server account. Accounts may contain mailbox data items like emails, contacts, calendars, tasks, to-do list, notes, journals etc. All of which can be moved to a corresponding account on Microsoft Exchange mailboxes. There is no data loss during the transitioning of accounts. Demo Version of Lotus Notes to Exchange Migration Software will only Migrate 25 Items/Folder for Each NSF File or Each Domino Server Mailbox. Lotus Notes Client is mandatory to be installed and configured and it should not be connected with Domino server. 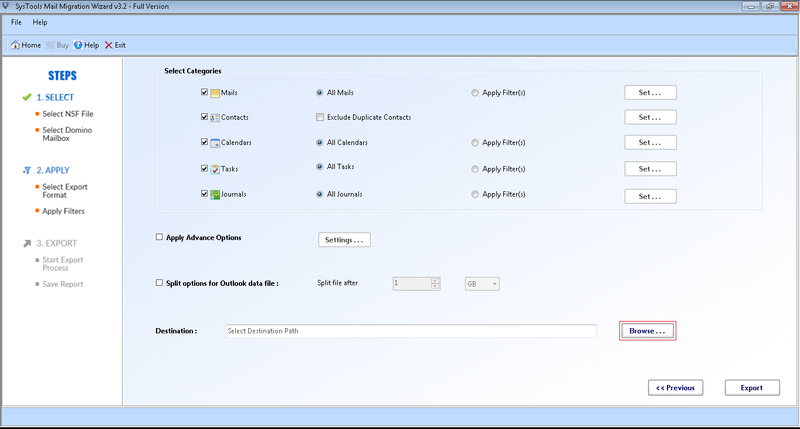 Outlook is required to be installed and configured for valid or dummy profile/account. For direct migration of data into Live Exchange Server, MS Exchange 2003, 2007, 2010 & 2013 Versions are supported. For Windows 10/8.1/8/7 or Vista users, launch this tool as "Run as Administrator". Lotus Notes – 9.0, 8.5, 8.0, 7,0, 6.5 and 6.0 versions are compatible. Domino Server – 7.0 and above versions are supported. Exchange Server – 2016, 2013, 2010, 2007, 2003, 2000 (32 & 64-bit). Are attachments exported with IBM Notes mailbox? Yes, the Lotus Notes Migration tool is efficient enough to migrate mailbox with an attachment from one account to another in different servers. Can this software also work on a Mac Operating System? No, the tool is not compatible with Mac OS systems. Can it also repair a Lotus Notes NSF file? No, an NSF file imported into the Lotus Notes to Exchange migration tool can not be repaired. What are the benefits of using the free version of this tool? The free tool has all the features of the full version. The only difference is that it can convert only 25 items per folder. Users who wish to buy the premium product can use this free one for the trial purpose. Can an NSF File be directly imported into the Microsoft Exchange account using this software? Yes, backup of Lotus Notes mailbox in an NSF file can be imported directly to an Exchange server account using this conversion algorithm. "This is a great tool to migrate Lotus Notes emails to Exchange Server. Even a non-technical person like me could transfer mailboxes data from Lotus Notes to Microsoft Exchange. All the emails were in the exact same folder and formatting as they were in my original mailbox. It has a Windows Explorer-like interface. It has made importing data from my NSF file to Exchange Server much easier"
"I was looking for a solution to move some of my contacts to my workplace IBM Lotus Notes to Exchange Server account. I was easily able to do that using the simple product guide. I was also able to remove duplicates that were repeating in my address book. It is very easy-to-use. This is an amazing Lotus Notes Migration product that works smoothly on Windows OS. Thank you!" Perform complete migration of mailboxes from Lotus Notes to Office 365 account. Move mailbox data items like emails, tasks, contacts, calendars, to-do list, notes, journals etc. Directly import IBM Notes NSF file into O365 account. Lotus Notes with Domino Server environment is essential. Administrative credentials for MS Office are needed before the transfer process. The Lotus Notes Migration Tool provides an option to migrate IBM Domino Server based accounts to Office 365. 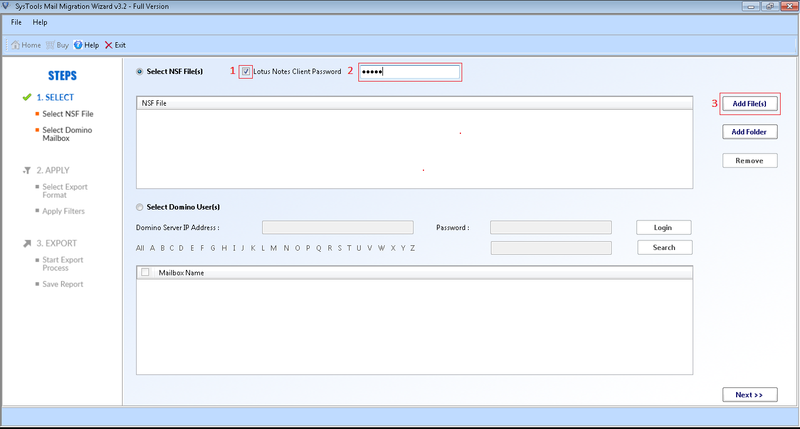 Prerequisites of this tool are Live Domino server environment with its administrative credentials, Admin username and password for Microsoft Office 365. A user is allowed to map account mailboxes between Domino and Microsoft servers. Use this feature to move multiple Domino server or IBM Notes accounts to Office 365 mailboxes. Proper mapping is done between accounts between IBM and Microsoft servers and then the data is migrated. There is no data loss during the transfer process. Data integrity and folder hierarchy is retained even after the conversion. The Lotus Notes Migration tool provides an option to its users to selectively migrate mailbox data items. There is a check box next to each data item like emails, calendars, to-do list, contacts. Just demark the items that are not needed for the conversion and save time and efforts. This also prevents any needless transition of data. The Lotus Notes to Office 365 Migration Tool also provides an added facility to move mailboxes under the same domain. This option is available with business edition for employees moving within teams in the same company. It helps users to switch accounts between sub-domains or within the same primary domain. The tool also allows moving of mailboxes between multiple domains. Apply Date-based filters for mailbox items like emails, calendars, to-do list. Set a date range to specify the period within which files are transferred. All email properties like header information and email formatting remain the same in a new account. The header contains useful information like cc, bcc, to, from, IP address, server details etc. All of this is maintained even after the export process is complete. The tool has an added feature to exclude particular folder and attachments from conversion. Just check a box and attachments will no longer be part of the export process. Similarly, type in the names of the folder with commas in a text box to exclude those from migration. There is also an option to disable HTML formatting of emails during transfer to save time. Lotus Notes Migration Tool prepares a live status report once the Lotus Notes NSF files in loaded into it. This contains the progress report of the undergoing process. The details regarding the item count, file name being transferred and the current speed of transfer. A final status report is also generated that contains file names, a number of items within each mailbox, time-taken, and file-size. Trial version of Lotus Notes to Office 365 Migration Software Imports 25 Emails/Folder from NSF file or Domino Server Mailbox to Office 365. Can the Lotus Notes Migration tool move data to Office 365 for business? 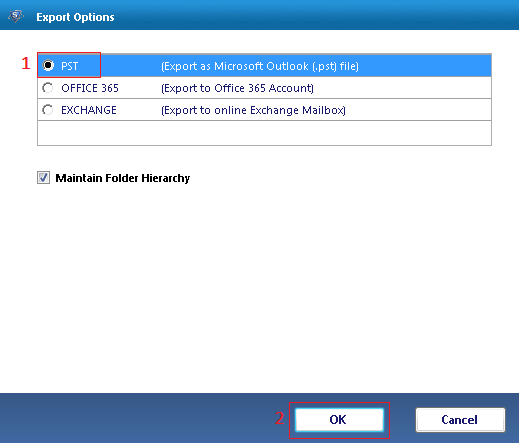 Yes, The migratory tool can move mailboxes between Lotus Notes to Office 365 for Business. Does the Domino Server needs to be closed to use this tool? No, Domino server need not be closed to perform functions using the Lotus Notes Migration Tool. Is the Domino Server Installation essential to import an NSF File to Office 365? Yes, Domino Server and Lotus Notes is needed to import a Lotus Notes NSF file into MS Office 365. Is there a version available for Mac operating Systems? No, this migratory algorithm is only compatible with Windows Operating System. Currently, there is no support for Mac OS users. The free version has only the features available in the full version. The only limitation is that it can move only 25 emails per folder. "This is an amazing tool. I was looking for a solution to move my emails from Lotus Notes to Office 365 Account. I was able to do that easily. Not only that I found the emails in perfect formatting and folder conditions. I was able to not only transfer my emails but also contacts and calendars. I want to thank the development team for their efforts. Kudos!" "Small, easy & significant are the words that aptly describe this tool. It is amazing what I could accomplish once I started using the tool. I successfully migrated multiple accounts from Lotus Notes to Office 365. I have purchased the full product & given it to my data center team. They use it frequently moving contacts, emails between employee mailboxes."